As the No. 1 Stationer on the High Street, Ryman are famous for stocking a broad range of quality stationery products, providing outstanding value and delivering excellent customer service. 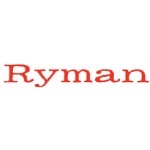 Visit Ryman for all your Home Office and Education Supplies.